LOS ANGELES (AP) - Like many a star attending the Academy Awards, Oscar's winners' envelope is getting a makeover. For 70 years, the envelope - as in "the envelope, please" - was nothing more than a plain, white paper envelope, the kind available at any office supply store. This year, the Academy of Motion Picture Arts and Sciences is glamming up the way it unveils the names of those winning the industry's highest honor: It's replacing the plain white envelope with a custom-designed keepsake envelope and announcement card that looks great on TV. "The idea of the envelope was created by the Oscars, so this really is THE envelope," says Steve Bass, the production designer for this year's show who helped usher in a new envelope era. "It made so much sense to heighten the visual experience of what the envelope is." The new envelope, designed by Marc Friedland, is made of iridescent gold paper watermarked with little images of Oscar. It's lined with shiny red paper embossed with gold Oscars. The winner's name appears on a heavy piece of lacquered red paper inside, with the category listed on the back. The envelope will be sealed with a shiny red sticker adorned with two strips of red ribbon. It was also designed for ease of use: It opens quickly and the card inside slides out smoothly, so no precious papers will be torn or mangled during the award announcement. "There's no more significant moment than the anticipation that comes with opening the envelope. 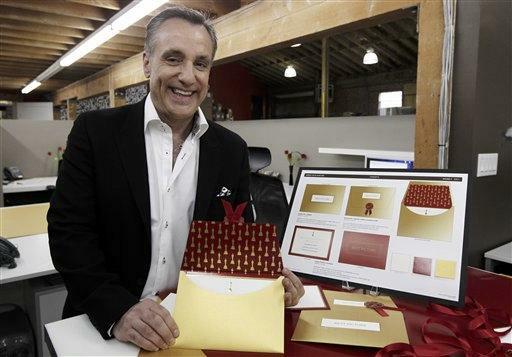 It's the most iconic, symbolic envelope in the world," says Friedland, whose company produces invitations for celebrities and corporate events. "Using a store-bought envelope is like showing up to the Academy Awards in shorts and flip-flops." Friedland says he had long been frustrated with the look of Oscar's envelope. It was "more functional than iconic," he says, explaining that the envelope was first introduced to the Oscar ceremony after a winner's name had leaked out early. Oscar producers Bruce Cohen and Don Mischer decided this was the year they'd upgrade the envelope. They turned to Friedland, who calls himself "the stationer to the stars," about two weeks ago. He says took design cues from the look of this year's Oscar set. "It has an elegant Hollywood regency feel to it," Friedland says. Academy officials haven't decided if they will redesign the Oscar envelope each year or stick with Friedland's red-and-gold design for future shows. The stationer called it "the most important envelope in the world" and says designing it has been the highlight of his 25-year career. He will also be attending the Feb. 27 ceremony. But he still won't learn the winners' names early. His deadline for the finished envelopes is the same day Oscar ballots are due: Feb. 22. Since the only people on Earth who know the Oscar winners in advance are two accountants at PricewaterhouseCoopers, Friedland prepared insert cards for each of the nominees. It's up to the accountants to stuff and seal the envelopes properly and shred any leftovers. He said he hopes the new envelopes become "a keepsake to accompany Oscars wherever they go." Bass, a two-time Emmy winner, says, "You keep the envelope. It's a huge part of the memory as well as the actual statue." The attention to the envelope on this year's Oscars is indicative of the producers' overall approach to the telecast, Bass says: "The envelope is just the tip of the iceberg for what people are going to experience on the show this year in a new, fresh way." AP Entertainment Writer Sandy Cohen is on Twitter. Follow her at: www.Twitter.com/APSandy.